Eating utensils are indispensable in modern Western society and nearly the world over. They have been used in many societies throughout history. The most ancient eating utensil is likely the knife as it is most important to cut food for consumption. Utensils have taken many different shapes and been used for a variety of purposes. From the humble spoon that has changed shape very little since it’s creation to the highly specialized utensils of Victorian era Britain. During this period the British high class had a utensil for every conceivable food connoisseur’s need. Such as the tomato server which was for one purpose only, to transfer tomato slices from the tray onto your plate. We still have a variety of utensils today that serve different purposes for food preparation and consumption. One example are the special utensils designed for use on outdoor adventures and camping trips. These utensils are uniquely designed to meet a number of demands. They must first be as light weight as possible while remaining strong. The must be compact for easy storage. They must be durable to withstand a lot of use. Camping utensils are often made from unusual materials in order to meet all these demands. Materials include high-temperature resistant plastic, aluminum, stainless steel, silicone, and titanium. 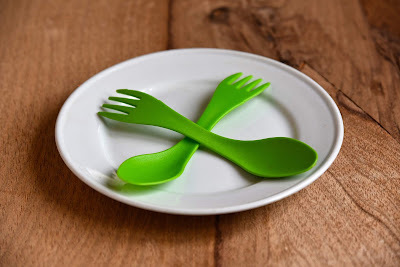 They are often designed to have multiple functions to save weight such as combining a spoon and fork into a spork or putting a fork on one end of the handle and a spoon at the other. Some camping utensils fold up to save room. Because of their unique qualities camping utensils are not used every day. We use regular forks and knives on a daily basis and save the camping utensils for that special purpose. We rely on them to do an important job and keep us fed when we go camping and on outdoor adventures. They have a special purpose. In the key text Paul compares God’s people to valuable utensils that are for special or ‘honorable’ use. God has important and special work that he wants us to do. This work involves sharing the important message of his grace and soon return! But he does not want any regular person for this job. The key text specifies God wants only those that are pure. The only way we can be a valuable utensil for God’s work is by accepting Jesus to cleans us and by living pure lives according to the Bible (see Romans 12:1-2). Only then will we be a special utensil for honorable use. Pray today that God will show you how to become one of his special utensils. What is your favorite camping food? If Jesus makes us pure does it matter how we live? What does it mean to live a pure life according to the Bible? If we fail to live according to the Bible's commands do we lose our purity?